A period of usually 12 months, for which the company produces financial statements and takes inventory. A fiscal year need not correspond to the calendar year. In this case, you must only select the Calendar year field. Either a fiscal year variant can be copied from the existing one or a new fiscal year variant for a company specific can be created. The fiscal year can be subdivided into up to 16 periods. These are divided into normal posting periods and special periods for closing purposes. This field contains the number of normal posting periods. Special periods represent an extension of the last normal posting period. When the posting date falls within the last normal posting period, then during document entry you can specify that the transaction figures be updated separately in one of the special periods. 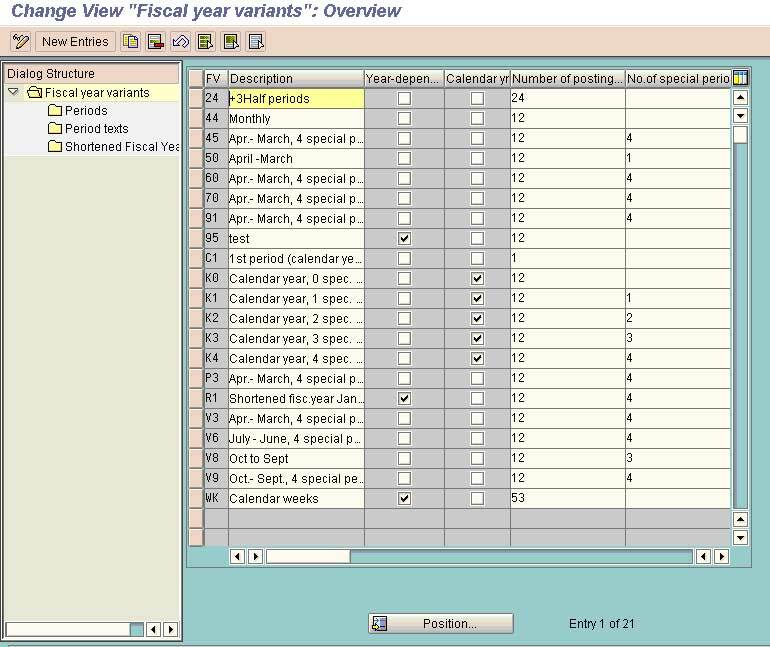 In this case, you can select as many special periods as you have specified here. This field contains the month as part of the calendar Year. The last valid calendar date of the Month. Period Texts: Describing the month for the period e.g. April for Period 1, March for period 12 for the fiscal year of April-March.